There are currently 116,986 users on this website. Toned Clad Kennedy Half Dollars - Any Value? Hey, everyone. I happened across a pile of clad Kennedy halves that are toned in a variety of ways. These were in a jar with a plastic lid, sitting on someone's kitchen window shelf. I havent taken any pictures yet. My question is, do toned clad halves carry any premium or should I just dump them? 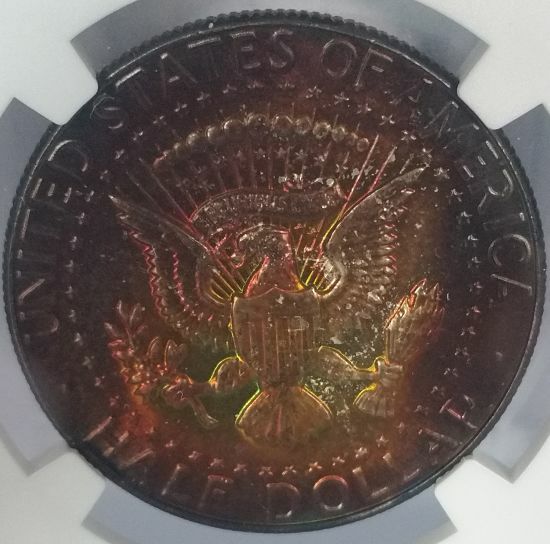 Without seeing any photos of these coins I would say any business strike clad Kennedy half that is environmentally toned would have NO added value . Just FV . No way to say without seeing them. 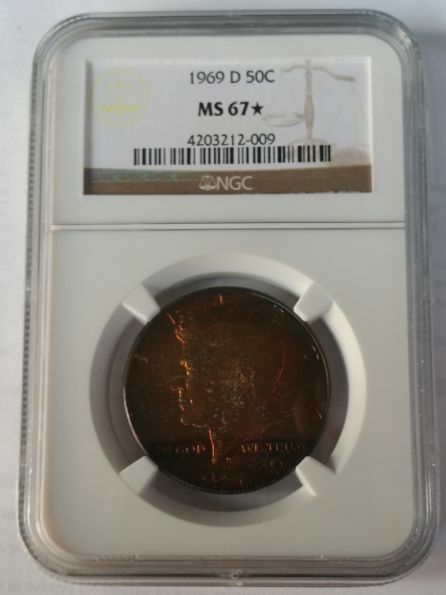 They don't, but I have a toned one which I sent to PCGS only because I found it cool. Depends on the eye appeal and the grade. Although I moved into my new place about 8 months ago, I've still not unpacked my camera. Hope I can get to that over the weekend. If so, I'll post a few pics. These halves have some pretty drastic toning - rainbows, copper tones, greens, etc. Most are lightly circulated, but there are a couple that might approach MS. Several bicentennial and some '70s & '80s dates. There were several 40%ers but they didn't tone as drastically or as interestingly. I'm kind of surprised at that. I made a commitment to find the.camera and take photos of these toned Kennedys. I've never tried to photograph toning and I am unable to capture the real color of these coins. Obviously need to practice with lighting. My setup works fine for detail on white or copper coins but fails to accurately represent the hues I'm seeing on this set of coins. You must move the coin around under a light to try and get a good photo of the tone. @solotime, thank you for the direction. I've already released these halves back into the wild. After acetone soak, none of them appeared to be better than AU. I've never been a toned coin collector, but I would certainly want to take advantage of any premium that might be there. I just couldn't see any. I have a Mason jar full of dimes in the same state and will set all the non-silver in that stack free as well. Someone in the area may end up with some funky looking coins in the coming days. I consider toning damage therefore making them undesirable. Plus I think toned coins are ugly. *And just a mix of everything else! 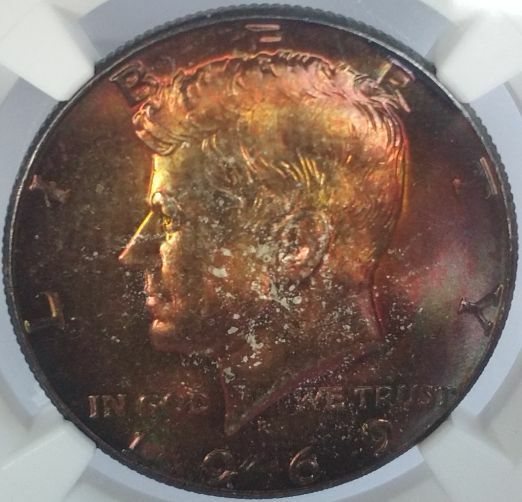 While I'm not sure that there would be much added value to the toning on a clad MS Kennedy half, proof issues can bring a bit of a premium. The silver's are a different story. 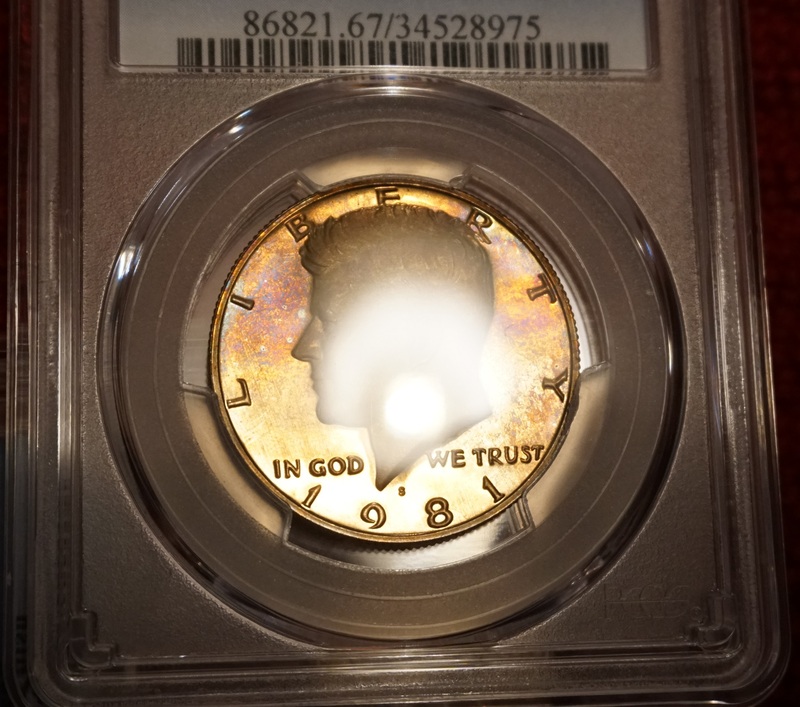 Here's my one and only toned Kennedy half - a 1969D MS67* and a personal favorite. Thank you for the photos, Singer Some of the clad halves I had look very similar to your example.